World is an exciting place today due to the ease of communication and collaboration with people worldwide that has been possible with the use of technology. This provides endless opportunities to learn. However, this new world has its own downsides. Therefore, it is important to learn how to keep yourself and your personal information safe as well as how to behave in online environments, because when you learn these necessary steps, so do your kids and students. Internet safety and digital citizenship is an important aspect to address in this technological era. Teachers and parents need to focus on it and they must look for wonderful existing resources to start with. Here are nine amazing resources for teachers and parents to promote internet safety and digital citizenship inside and outside the classroom. Common Sense Media is a great place to look for good advice for digital citizenship and internet safety. 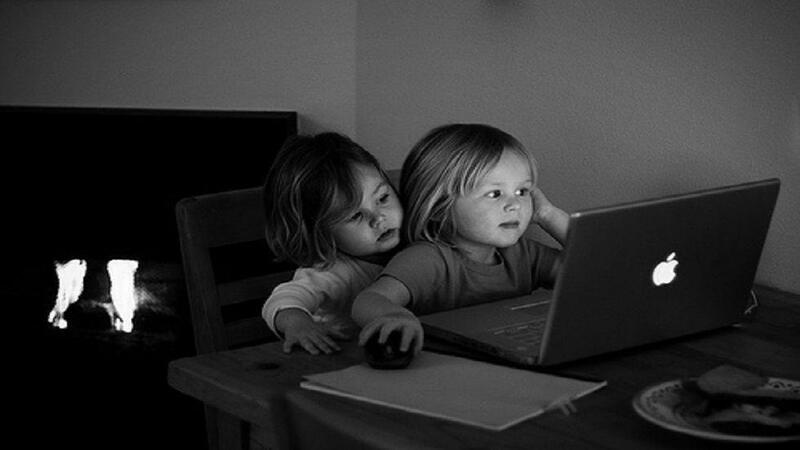 On this website, you will get amazing tips and post for helping kids how to stay safe while using the Internet. Apart from this you will also get a lot of resources. NetSmartz is a platform that is solely dedicated for Digital Citizenship. The workshop organised by NetSmartz is interactive and informative. Over the website, you can find enormous resources in the form of videos, games, activity cards, and presentations. NetSmartz educates meanwhile entertain and engage kids and adults in a two-way conversation about online and offline risks. If you wish to adopt the Digital Citizenship and Internet Maturity curriculum in your school, visit the website to know more. InternetSafety101 is developed to educate the dangers as well as to endow capability in the students to understand the cautionary signs and with useful means to debate Internet safety with the students; also offer safety resources. iKeepSafe through its network tracks global trends and issues surrounding digitally connected products and their effect on children. On this platform, one will always finds the best resources for the educators, parents and policymakers. Using these resources, educators can teach their students how to use new media devices and how to platform safely. BrainPop offers valuable content on digital citizenship. The platform covers crucial topics like online safety, cyberbullying, information privacy, digital etiquette and much more. Resources available over here are very useful resources for educators. Using these contents, teachers can help their students to understand how to behave appropriately online, importance of interacting humbly online, role as digital citizens etc. DigitalID is a platform that offers students, educators, and school admins with a toolkit of huge, resources, guidelines and information to assist everyone to learn how to be honest digital citizens who keeps a well Digital Identity in online space. Edmodo and Common Sense Media have created a digital citizenship starter kit. 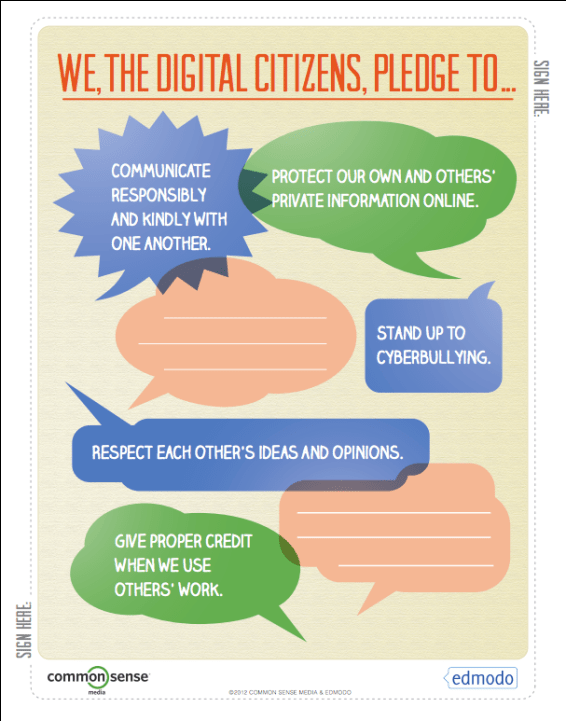 This kit contains three lessons about the digital citizenship. It showcases key points how to be responsible citizenship. See the pledge sheet below. You can download the kit from the Edmodo page. CyberWise is a media literacy learning platform for adults and dedicated to assist parents and educators as well as kids how to use digital media safely and confidently. Through short films, interactive comics, animated videos and games, NSTeens teaches teens how to make safe choices online. Over this platform, teaching materials for intermediate, middle school, and high school teachers are available.